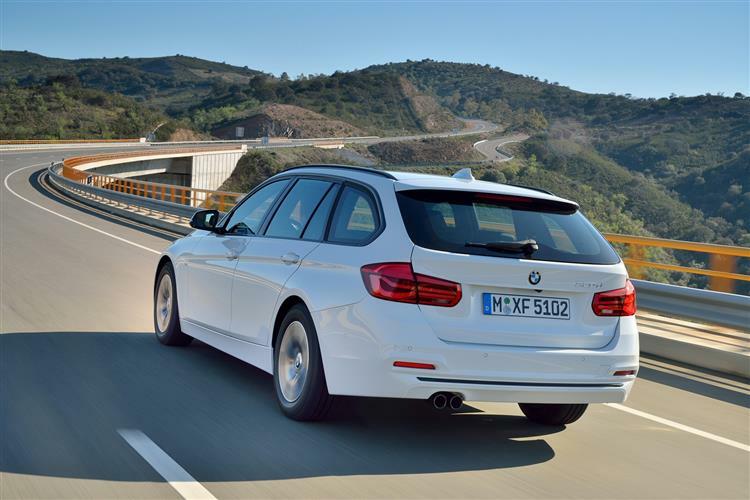 The improved sixth generation of BMW's 3 Series Touring holds no great surprises to those who understand the narrative of this model. It's not the most accomplished load lugger in its class but it's the best drive and offers the most efficiency. That'll be enough to clinch the deal for most who just hanker after a 3 Series with a hatchback. This revised version gets revised styling front and rear and much stronger levels of efficiency thanks to a rejuvenated range of freshly-developed four and six cylinder engines. Conventional wisdom dictates that estate cars are designed for people who can't fit all the paraphernalia of modern life inside a conventional saloon or hatchback model. 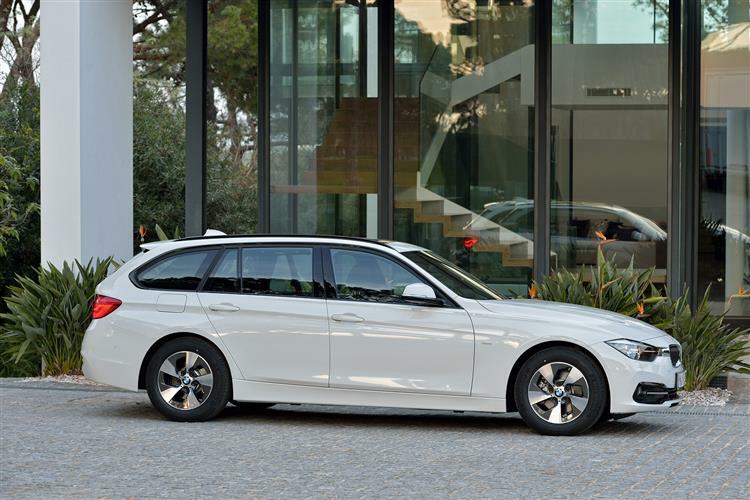 You'd certainly imagine that an estate would require a lot more space than the saloon on which it is based in order to justify its own existence but, particularly in the compact executive sector where BMW's 3 Series Touring competes, it isn't always that straightforward. It will be a surprise for most people to learn that many compact executive estate cars are only fractionally roomier than their saloon equivalents and some even have less space out back. In this case, you get only 15-litres more boot capacity than you would in the saloon, despite a near-£1,500 price premium. But then you don't buy a car of this kind for its luggage-cramming talents. Yes, you want a bit of practicality but if you're a typical customer, you'll be more interested in the fact that the estate bodystyle is a little more 'lifestyle' and a little less 'field sales' than a saloon is perceived to be. BMW has traded on this for years with the 3 Series Touring, as has Audi with ts A4 Avant and Mercedes with its C-Class Estate. With both these two German rivals now usefully improved, BMW needed to up its game. Let's see if it has. The well-versed themes of the 3 Series are present and correct in this latest generation Touring. 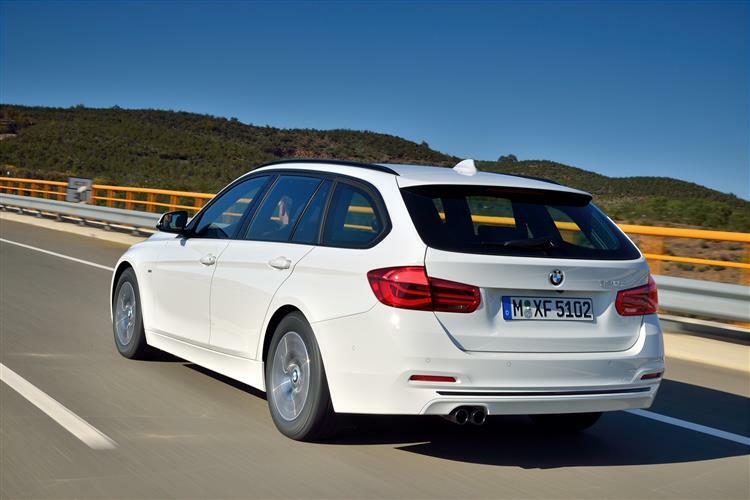 The car in question is rear wheel drive, it features a very meticulously balanced weight distribution, and, as a result, BMW is keen to position this Touring as the best model to drive in its class. What has changed in recent years is a clearer focus on efficiency and this generation Touring campaigns with some hugely impressive engines. If you're of a generation who remembers the badge on the back of a 3 Series denoting its engine size, you might be a bit confused by the latest line-up. The 330i, for example, no longer packs a six-cylinder lump, instead squeezing 252bhp from its turbo four, replacing the old 328i in the process. If you do want a six-cylinder petrol engine, BMW will sell you the 340i, a new variant that delivers 326PS (the same as the old 'E36' M3 Evo super-coupe) and will take a blink over five seconds to get to 62mph. At the other end of the petrol engine range is - and you might want to take a seat for this - a 318i model featuring a 136bhp three-cylinder 1.5-litre engine that's been pinched from the MINI line. Most of the diesel engines are heavily modified or new. At the base of the range is the 116bhp 316d and the 150bhp 318d derivative, but the most attractive models will likely be the 320d and 320d Efficient Dynamics Plus variants. 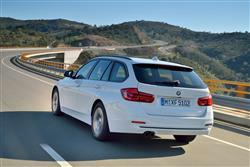 The regular 320d weighs in with a gutsy 190bhp, for a 0-62mph time of 7.6sec in manual form. The aforementioned 320d ED wields a more modest 163bhp but retains the same 400Nm torque, so it's not much slower but it is a whole lot more economical. The 258bhp 330d is automatic only and scuttles to 62mph in 5.6sec, while there's a 313bhp 335d at the top of the tree with a huge 630Nm. 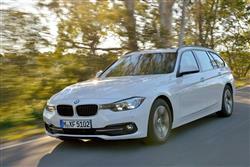 BMW will continue to offer the 3 Series with its xDrive four-wheel drive system. It's available as an option on the 320i, 320d and 330d and is standard on the 335d. Munich has also made big advances with the latest eight-speed Steptronic transmission. It won't surprise you to learn that from the front bumper to the B-pillar, the 3 Series Touring is identical to the saloon version. 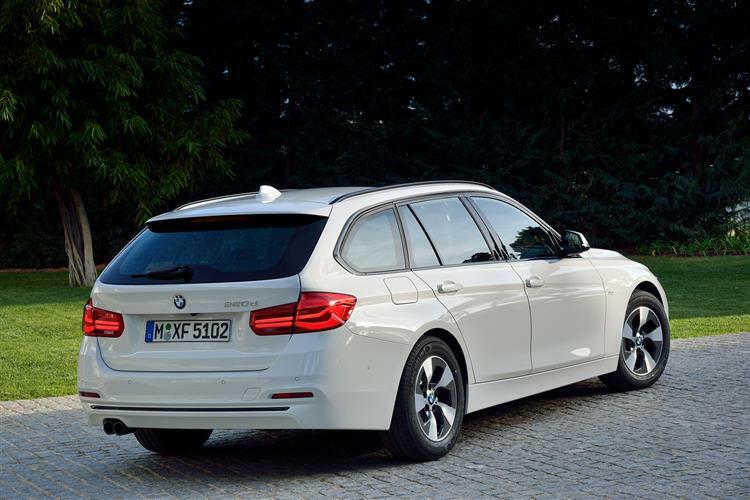 From the side, this generation 3 Series Touring is defined by a sweeping silhouette, with a gently sloping roofline and glasshouse that extends to the rear of the vehicle. Onto the aesthetic changes made to this improved model. BMW has revised the front and rear bumper assemblies with broader horizontal elements. The headlights have also been tinkered with, LED indicators now acting as eyebrows across the top of the light units. At the rear, the tail lamps are full-LED units with more heavily curved light bars. There is also a revised range of wheels, with rims up to 19 inches in diameter available as an option - and 20-inch wheels can be selected from the BMW accessories range. The cabins have had a similarly light touch applied to them, with a splash of chrome here and a high-gloss surface there. Other updates include cup holders in the centre console with a sliding cover and an additional practical storage area for items such as a smartphone, positioned forward of the cup holders. There's a respectable amount of rear legroom for what remains a manageably-sized car. The boot practicality is unchanged. Offering 495-litres capacity with the seats in place, this latest Touring model offers only a nominal increase in carrying ability over the saloon version, but the entrance aperture is a lot bigger, allowing you to transport bulkier objects that much more easily. The rear loading sill is just 620mm off the ground and the luggage bay gets securing lugs, a pair of coat hooks, a luggage net and strap and a deep storage compartment on the left-hand side of the load area. The luggage cover can be stored under the boot floor when removed, while the rear seats have a 40:20:40 split. A sizeable through-loading hole in the centre adds versatility. Fold the rear seats down and there's up to 1,500 litres of space on offer and a near-level load floor means sliding large items in isn't too tricky. An electrically powered boot, controlled either via the key fob, a switch on the A-pillar or a button on the boot itself is standard and the rear glass can also open independently of the tailgate. In addition, customers can specify optional storage packs, roof transport systems, a trailer hitch and the 'Smart Opener' feature where the boot can be opened with the motion of a strategically placed foot beneath the rear bumper. The premium to get yourself this Touring estate version of the 3 Series rather than the saloon version is just under £1,500. That means pricing that starts at around £26,500 for the petrol range and just under £29,000 for the diesel line-up. The Touring range shares the same trim structure as the saloon models, SE, Sport, Luxury and M Sport. Equipment levels have been beefed up (as they needed to be) and all versions of this car get a very complete tally. Even in SE trim, this runs to alloy wheels of at least 17-inches in size, a chrome-trimmed exhaust, LED daytime running lights, LED rear lights, tyre pressure monitoring and auto headlamps and wipers. Inside, you'll find two-zone air conditioning, Bluetooth, cruise control, a BMW Business Navigation system, a high quality stereo system with DAB tuner, a multi-function leather-trimmed steering wheel and BMW's 'Emergency Call' system, there to automatically alert the emergency services should you have an accident. BMW has concentrated on improving the efficiency of the 3 Series Touring and there are benefits right across the board. The three-cylinder petrol engine in the 318i variant records CO2 emissions that can be as little as 133g/km in manual form, or as little as 129g/km with the eight-speed Steptronic transmission fitted, a big improvement over the previous BMW 316i. Fuel consumption is equally impressive, with the 318i Touring returning 49.6mpg in manual form. The 320i Touring isn't far behind with CO2 emissions that can be as low as 141g/km in manual form (or 134g/km as an automatic) and fuel consumption that in mnual form can see the car return as much as 46.3mpg in manual form. Of course, most UK customers will look to the diesel engines and they're not going to be disappointed. 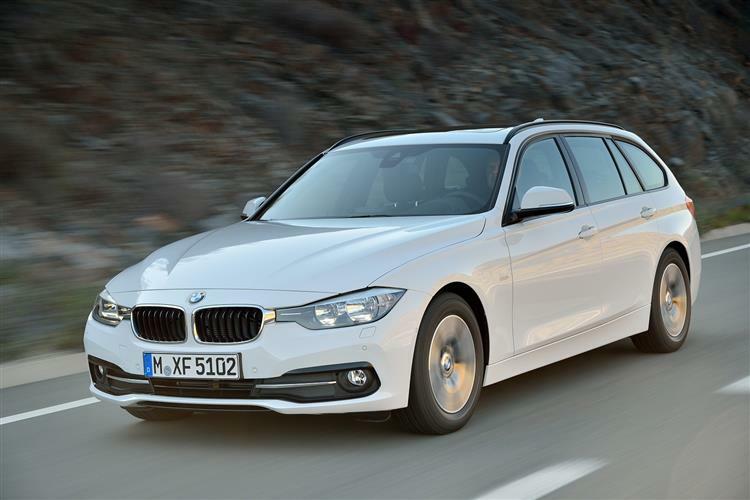 For example, the 316d Touring manual model returns up to 64.2mpg in manual form, with CO2 emissions of 116g/km. Go for the pokier 320d Touring manual model and though you get more power than the pre-facelifted 320d variant could offer (up from 184 to 190PS), emissions have been reduced by 6% to just 118g/km, along with a combined cycle fuel showing that can be as good as 62.8mpg on the combined cycle with a manual gearbox: not at all bad for a car that can hit 62mph in 7.6s. There's also a 320d EfficientDynamics Plus version that improves that showing to 68.9mpg and 107g/km in manual form. The Steptronic automatic transmission option marginally improves all these figures and now features a coasting mode so that when the driver lifts off the throttle at higher speeds, for example on a gentle downhill grade on the motorway, the engine is automatically decoupled from the powertrain. It then simply ticks over in neutral, which saves fuel and ensures there is no unwanted engine braking at high speed. An additional fuel-saving feature, which also improves driving comfort, is the new Proactive Driving Assistant, which uses information from the navigation system to "anticipate" upcoming roundabouts, corners and junctions and select exactly the right time to change gear. The 3 Series Touring has long been one of the quiet achievers in BMW's model range. It might just be the lowest key car the German giant sells but it's also one of the most impressive. Look behind the low-key styling and you find a car that does so much so well. What's more, estate car buyers usually have a sense of the pragmatic and will appreciate the great strides BMW have made with this improved version in terms of efficiency. It used to be that nothing really got close to a 3 Series in this regard. The gap has narrowed in recent years, but this 3 Series Touring still astonishes in offering sports car straight line speed with supermini fuel and tax bills. Plus of course, this model retains its unique selling point, something that no other prestigious compact estate in this segment can offer - rear wheel drive. If you're an enthusiast, you'll appreciate the benefits at once the first time you throw the car into a corner. Even if you're not, you might notice more responsiveness through the turns than you might usually expect from a car of this type. With contenders in this class so closely matched, it's the sort of thing that might tip the balance BMW's way. Try a Touring and you'll see why.